Cats Protection has been granted planning permission to move its Wrexham Adoption Centre to the town’s former fire station in Bradley Road, enabling the charity to help around 500 local cats and kittens a year. The charity has outgrown its present adoption centre in Madeira Hill and believes the old fire station site is ideal for the new state-of-the-art single storey cat centre. Proposals for the cat adoption centre have been approved by Wrexham County Borough Council with demolition of the old fire station planned to begin next year. The central location of the new centre is expected to attract more potential adopters when the centre is up and running by spring 2019. Cats Protection Project Manager, Catherine Hodson, said: “We are delighted that the planning permission has been approved. Moving to the new site will enable us to rehome even more cats with the number of pens increasing from 30 to 48. “Cat welfare is our priority and we are making sure we provide cats with a more fulfilling environment while they’re waiting for homes. 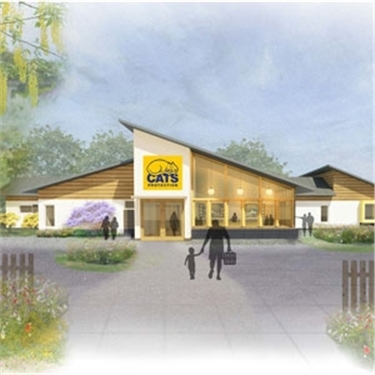 This will include larger pens with a landscaped courtyard providing a therapeutic environment for the cat population with the building serving to act as a visual screen to protect and provide privacy to this area. Cats Protection’s Wrexham Adoption Centre is part of a national network of over 34 centres and 250 volunteer-run branches and that help around 190,000 cats and kittens each year. The Bradley Road fire station closed last year when the new ambulance and fire service centre opened in Croesnewydd Road, Wrexham.